Bedroom idea for kids that uses a lot of colors and ample layers with a nice study table and plenty of racks for the storage purpose. 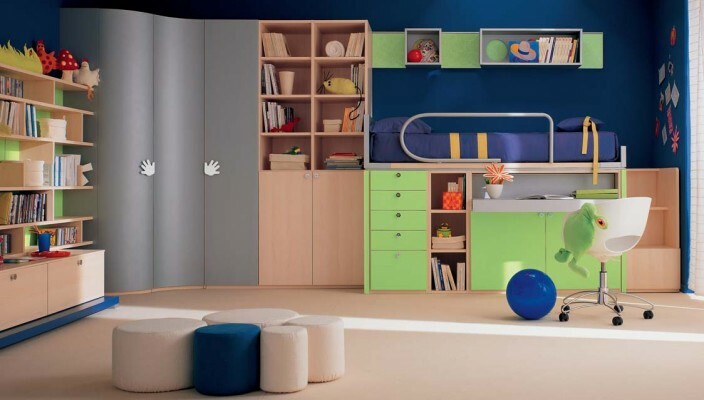 This bedroom concept uses plenty of colors for the kids, who like things bright. The design features a study table along the wall in a green finish, while the racks for books are designed in natural light wood finish to ensure colors haven’t been compromised in contrast. With a few tools to encourage more activity, the design also features a wall portion in a steel finish. The floor bears a simple finish in light shade.